6(6)6 Year Anniversary is Coming! Add yourself to the Official Facebook page HERE! This year we celebrate the 6 year anniversary of “A Mediocre Time with Tom and Dan.” Just as Satan fell out of good graces with God and was in turn banished to Hell – we too have fallen out of favor with mainstream media and we now reside, with all of you BDM’s, in our own personal “comedy hell.” How dramatic. 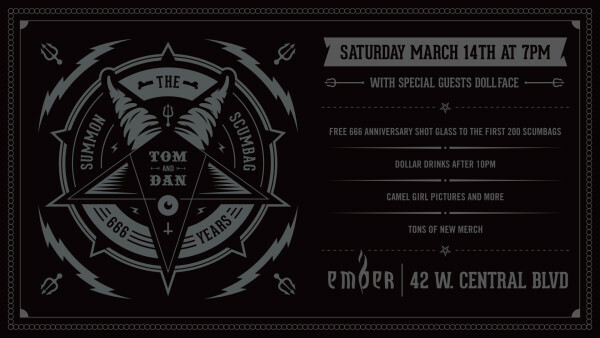 With that said, we hope that you will all join us Saturday, March 14th at 7pm at Ember – Downtown Orlando. For we will gather and celebrate our “fall to greatness” together as a demonic family! 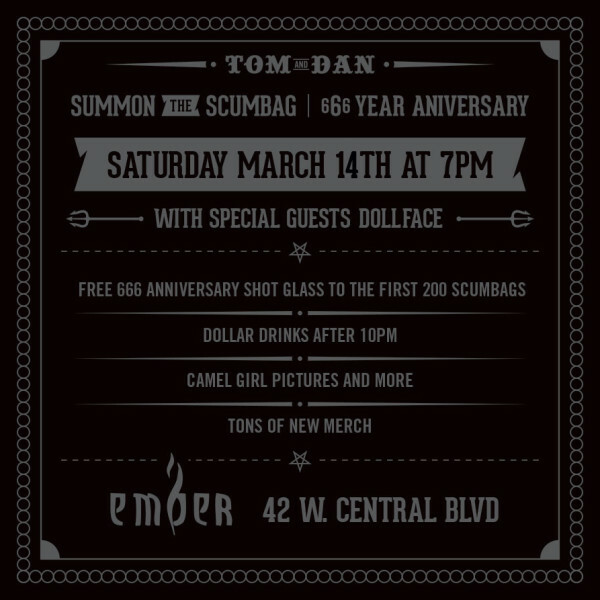 We are “Summoning The Scumbags” to invade and destroy March 14th! The “World Famous” Camel Girl or Girls will be on site for pictures! There will be tons of new and never before seen merch! And here’s the best part – making her triumphant return to O-Town and as a special gift to the “Scumbags,” Tiffany Martin and her band Dollface will be playing one night and one night only! Tiffany has always been one of the greatest friends and supporters of the show and we can’t wait to see her do what she does best! Please join us March 14th – 7pm – Ember Orlando – Downtown. This event is for all listeners – not just BDM’s. With that said, we will have a special gift for all BDM members courtesy of Lagunitas Brewing Company but the only way you’ll be able to take advantage of it is if you wear BDM merch. Repeat – YOU MUST BE WEARING BDM MERCH TO RECEIVE THE BDM PERK!